HANK PHILLIPPI RYAN: You know how much I love it when the Jungle Red week gets a theme, right? And more on that in a moment. But first. Look at this cover! Does it not stop you in your tracks? This is as irresistible as it gets, right? Most writers—especially those who don’t write in a series—will tell you that the process for every book changes. Some books come after months or years of struggle to make the characters dynamic, the world palpable, and the prose seamless. Other books demand to be written and drag the author along for a wild ride. My first three books were, to varying degrees, more like the first scenario with glorious moments of the second. 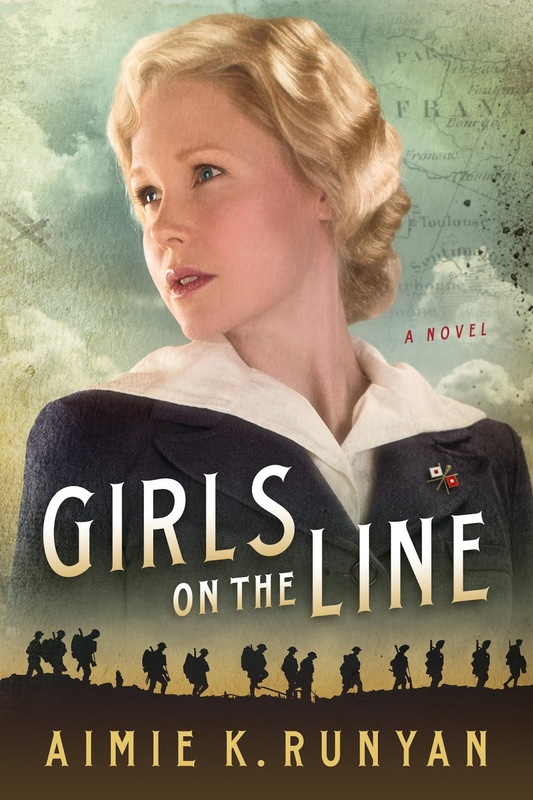 My forthcoming novel, GIRLS ON THE LINE, fell almost entirely within the second category. I began working on the story after a friend sent me an article about the women who served as telephone operators in France during WWI. The concept was compelling, and there was a lovely new nonfiction book on the topic that would be a great resource for tracking down primary sources and the like. I sat down to read that nonfiction title, HELLO GIRLS by Elizabeth Cobbs, and my protagonist, Ruby, sprang forth in my brain as I was reading. Compared to my previous novel, DAUGHTERS OF THE NIGHT SKY, whose protagonist, Katya, refused to make friends with me for months, this was an absolute treat. I’ve discovered that once you have the main character in hand, most everything else falls into place. Once I had my outline, synopsis, and some sample chapters in, I made my way to Kansas City, Missouri and the National WWI Museum. The archivists ushered me in graciously, and I was greeted by the sight of hundreds of letters, photographs, postcards, journal entries, and other military paperwork the women had entrusted to their lawyer, Mark Hough. You see, the women, despite having taken the oath of service to the US Army were informed upon their return that they were actually not soldiers, they were civilian contractors, and not entitled to veterans’ benefits. Despite the fact that they could not resign their posts at will. Despite the fact that they could be court martialed. Despite the fact that enlisted men were forced to salute them, and they in turn had to salute officers. They were absolutely part of the military hierarchy, but had their status revoked as soon as there was no need for them. For sixty years, they fought for the recognition they deserved, but it wasn’t until that young lawyer, Mark Hough, took the case for them in the 1970s that the government finally acknowledged these women. 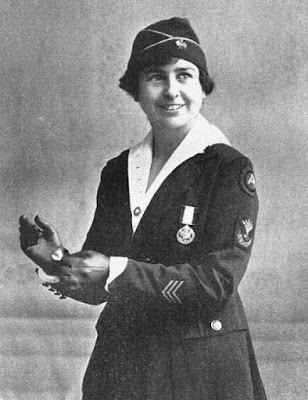 Chief Operator Grace Banker receiving a Distinguished Medal of Service for her role in the US Army Signal Corps in WWI. In 1979, Hough won the case, and the 28 remaining Hello Girls (of the nearly 250 who served) were awarded their victory medals and due rights. 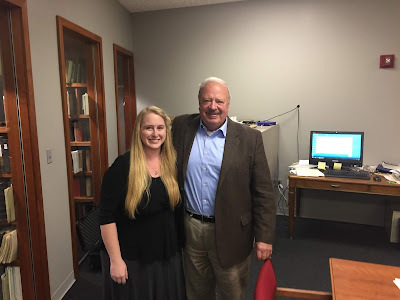 I was passionate about telling this story, but if there was any doubt that I was meant to be a part of it, it was when Mr. Hough himself came into the museum archives for an interview. I’d had no idea he would be in town or that I would ever have the opportunity to speak with him, but I had the chance to listen to him tell his anecdotes about these wonderful women for several hours and ask him the questions I didn’t even know I had. I know that the experience breathed life into my book that wouldn’t have been there otherwise. People may think museums are nothing more than dusty relics, but I assure you, there is magic in the sprawling underground archives that most visitors never see. And while writing a book can be excruciating at times, sometimes the universe comes to you. HANK PHILLIPPI RYAN: Oh, I am transfixed. And I have so many questions! But what women do you know who were in a war? Have you ever thought about what you might have done if we were twenty-somethings in 1915? Or 1940? What about Vietnam? Or what questions do you have for Aimie? 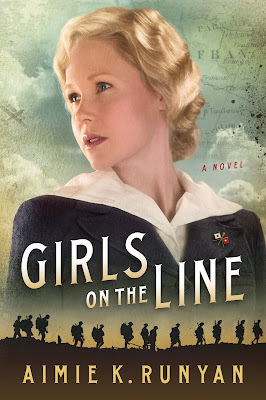 In GIRLS ON THE LINE, what begins as a friendship forged on the front lines soon blossoms into something more, forcing Ruby to choose between the conventions of a well-ordered life back home, and the risk of an unknown future. Aimie, your book sounds so interesting . . . I’m looking forward to reading it. What might we have done if we were the young women making those hard choices in wartime? It is something to ponder, isn’t it? I often think about it, Joan..especially when I read books like these.. I think about that a lot too, and my WIP explores the idea a lot. Thanks so much for your kind words!!! Aimie, your book sounds fascinating! Honestly, I don't think I would have been as brave as those wartime women. It's hard for me to even imagine what life was like back then. And the injustices and waiting decades for acknowledgment as equals is infuriating. I bet it was amazing getting to talk to Mark Hough and hearing some of these women's stories! I'm with you about not being brave enough--the war must have been such a terrifying experience. Exactly, Marla. We can't even imagine the reality. Well I'm hooked for sure! Sounds fascinating and this is a time period I love to read about. I'm definitely getting this book. My mother was finishing nursing school when WWII broke out. She enlisted in the Navy upon graduation. She rarely spoke about any of the horrors she must have seen but I'm sure there were many. She did say she worked a lot with Marines wounded in the Pacific. She's 98 now with dementia. Because of her service she's getting fabulous care in a veterans' home. I am so proud of her. At least she didn't have to fight for her veterans rights. So many women had to. I had never known about these telephone operators but some ferry pilots went through the same thing. Thank you for this, Aimie. Marianne-so interesting..and give her a grateful hug from us. Hank, they were WASPs - Women Air Service Pilots, I think. (WWII) They would ferry war planes from factories to where they were needed. The U.K. had a similar group. It was not until the 70s that they earned veteran status. I remember not too long ago they were also granted permission to be buried at Arlington. Oh please tell your mother I am so thankful for her service and sacrifice. Thank you so much for your kind words! Wow, thank you! Leave it to the military... And how wonderful you could connect with a man who knew and fought for the rights of the women. I also write historicals, set in the late nineteenth century in my New England town, and have been privileged to talk with some very old but sharp citizens about their foremothers and what they knew of daily life back then. Yes, what a wonderful coincidence! It was the chance of a lifetime and I still get tingles when I think about the interview. Humbling doesn’t describe it. Wow! I'll definitely be reading this one! While I was in high school I seriously considered going into nursing and then somehow I was talking to the Army recruiter. It all sounded very good. Ultimately I went in a different direction and that is how I did not end up as a nurse in Viet Nam. Thank you so much, Judi!!! Aimie, that cover is like a Valentine to those young women--it alone would be enough for me to grab a copy of this book! Thanks for sharing your process--and the story of these forgotten women. As a young woman myself eons ago, I began the process to enlist in the navy--but then, there were the issues of a) skirts and b) all that saluting. The cover takes my breath away. Lake Union simply nailed it. Thank you so much!!! Aimie, I so wish my darling maternal grandmother was still alive to read this. First off, she was a voracious reader who, after raising nine children, spent most of her nights with books, reading two or three each day. She favored novels about nurses, but this book would have resonated with her for a different reason: Grandma, in 1919, began her adult life, prior to marrying my grandfather, as a telephone operator in my hometown of Hamilton, Ohio. Even into her late years (she lived to be almost 93) she had the sweetest telephone voice, and talked about having to memorize every single phone number in town. Granted, there were probably only a very few hundred numbers, and those were much shorter than our numbers today, but she had to be able to connect the right party from memory. 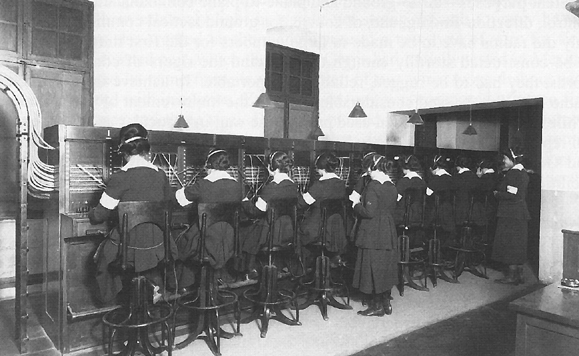 It would please her no end to know that women phone operators were heroes in the war. I cannot wait to read this. Thank you for telling this story. That's lovely, Karen. Aww. What a sweet memory. Hi Aimie, and thanks for writing this book. I'm off to Amazon as we speak! Presently I am watching "Foyle's War" again, and WWII is on my mind. I had no idea these women existed, nor did I know about the museum in Kansas City. I do, however, remember telephone operators. We called them "Central." I grew up in a very small midwest town, and the local doctor always told Central where he would be in those days even before pagers. If someone needed him, all that had to be done was call Central. This book is on Kindle unlimited and is now in my library! WOw, good find, Ann! Looking right now. And you had Central? Very cool! Yep, I mention the Central Office in Philadelphia a *lot* in the book. I hope you enjoy it! I love the cover on this book and am fascinated with the story, Aimie! I've seen DAUGHTERS OF THE NIGHT SKY and thought about picking it up - I'll check out all your books. How wonderful that your got to meet and visit with Mark Hough. I had no idea that there was a National WWI Museum in Kansas City. I do love museums, though I've never been to the depths where the 'good' stuff resides. Thanks so much for sharing all this with us! I've always thought that being a phone operators would have been interesting. So glad to know about the these women and that they finally got their recognition and benefits and honors. Hank, I've loved all the posts this week and the topics. Really, really fun! Oh, Kay, how wonderful of you! Thank you! And yes, A jungle Red field trip, led by Aimie, to the WW1 museum? I fear I would cry, though. I would LOVE that! The museum is awe inspiring and wonderful. Any time and I’ll hop on the plane to KCMO! Wow, Aimie! What a wonderful story and what a great cover! Your book is definitely going on my list. I also want to thank you for this perfect example of the value of primary research. As writers, we can go to the archives and haunt the museums, but there's nothing like talking to someone who was there, or remembers people who were there. I might think I know how a system works, and read procedures manuals on how a system works, but talking to someone who worked in that field, using that system, is the only way to find out how a system REALLY works. I've found out about people, situations, and coping strategies that went way beyond my ideas of weird, funny, or unusual every time I talked to someone who had boots on the ground. Some crazy stuff happens in this world, and it's great when you can find smart, funny, resourceful people to tell you about it. SO agree! That's the only way to get the true feel. Which is why the oral histories are so important, right? This was my first chance to connect with people so direct related to my story. I am still in shock that I have had the privilege to correspond with the granddaughters of these brave service women! Oral history is a wonderful thing, Hank! I have never heard of this, and I am a history fan for sure. Looks wonderful and it is going right on my list. Thank you for sharing stories about your process - so interesting. To answer Hanks question: I was a young woman in the Viet Nam era, a painful time. While I was out demonstrating against an unjust war, boys from my small town America high school were in the Army. Privileged young demonstrators screamed "baby killers" and I thought, "No, they're kids who did what their dads and the president told them was the right thing." Confusing? You bet. Exactly, Triss. We are of the same era---and it was incredibly difficult. Thank you so much! I really hope you enjoy the book. I don’t envy living through the Viet Nam era... it had to be a very unsettling time! Fascinating! I love books about WW1 and the aftermath. It’s really under studied in the US and I was grateful to learn more! My material grandmother was a Navy nurse stationed in Philadelphia during WWII. The other grandmother worked at Bell Airplane making P39s. I could have done the factory work, but I'm quite sure I never would have made it as a nurse! I am in awe of nurses...I could never do it. Let alone in wartime. Ah. I couldn’t either. And my MC Ruby says the same of herself. The nurses and operators didn’t get along, but I think there was a grudging respect. Aimie, I am looking forward to reading your books! Like Hank, I wonder what I would have done as a young woman during any of the wars in the past century. I had relative who worked in plant making lenses for bomber sites and one who was a WAVE (Women Accepted for Volunteer Emergency Service, U.S. Naval Reserve). They're gone now and I wish I'd asked them about their war time service. I’d like to think I’d have done something, but unless we face these times ourselves, it’s impossible to say! ANd it's difficult, anyway, because sometimes people don't like to talk about it. Aimie, I am so intrigued by this story description. There is so much about the WW1 era still to be explored, and it is one of my favorite historical periods for reading. I am going to order this pronto. Best of luck with it! I am fascinated by the Great War era. I don't know why. It just calls to me. I do have a few copies of letters my great uncle wrote from training and then from France in 1918. He was an artilleryman and lucky to make it back in one piece. I had no idea there was a WWI museum in KC. The WWI section in the Smithsonian is pretty limited and small. By now we all know about women serving as nurses and ambulance drivers. But telephone operators? That is new to me. I will certainly be reading this book! Do you remember what he said in the letters, Pat? He talked about his training, how he actually gained weight. He talked about all the states they rode the train through from Ft McClellan, Texas all the way to Camp Merritt, NJ. He went over to France in August, 1918 and his letters to family were all upbeat. He did mention conditions, battles, air battles, dodging shrapnel, all in a positive fashion. They were in the field Armistice Day. From the letters it looks like he was still in France in May, 1919, still waiting to go home. The book sounds wonderful. I'm wondering is there a mystery element in it? I had no idea these women existed, though I guess the telephones had to be run. Agreed! But you never really think about it, right? Pre-ordered on Kindle! I absolutely adore this era of history, and I don't think it's covered enough, especially from a woman's POV. Thank you for writing about it, Aimie. I can't wait for November to read this! So frustrating to have to wait, right? I had no idea that women served in that role, Aimie! Thanks for the education. The book sounds intriguing! Is there another period of history or a particular population that you're itching to write about? You asked about what women we knew who were in the armed forces. My aunt, Betty Culbertson Sherrell, was in the Coast Guard during WWII, although she never talked to me much about what she did, only that it was where she met my uncle. 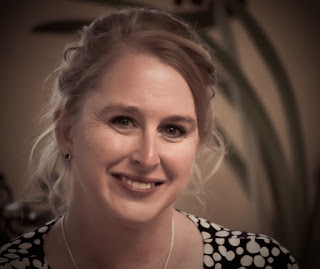 Fantasy writer Elizabeth Ann Scarborough was a combat nurse in Vietnam, and wrote about her experiences in her Nebula Award winning novel, The Healer's War. Hi Aimie! Just pre-ordered the book--now frustrated that I have to wait until November to read it! I love reading about this period, and I love historical research, and love finding out the amazing unsung things that women have done, so this ticked all my boxes. I'd love to know what you're tackling in your work-in-progress. Aimie is at RWA in Denver! She's keeping up reading though, so keep them coming! I have a friend whose parents were Polish and served with the British in World War II. His father had been part of the Polish Calvary, then he went to fight for Great Britain, and his mother worked for Britain as a codebreaker. His mother could not tell him what she had done in the war for many, many years for security reasons. Oh the most fascinating thing ever! Do you have any idea exactly what she did? And cavalry, really, just gives you chills, right? I'm NOT a fan of Kindle Unlimited, as I dislike the manner in which they compute sales and author payment. But regular Kindle is fine, and for this one, I've pre-ordered the hardcover. Sounds fascinating! Doesn’t it? I’m still a novice on Kindle unlimited… We should talk about this! I have absolutely got to read this book! And, how had I not known about your previous work, Aimie? Writing about the unsung heroines must be such a rewarding project. Interviewing the author of the non-fiction book was such a great bonus for you and in return, for readers. I hadn't heard about the Hello Girls, as I'm sure many others haven't either, and they so deserve to be recognized. I recently watched a PBS special about WWI, and while it was amazing, it was about the men of the war. My husband and I visited the WWI Museum in Kansas City last year and enjoyed it so much. Two years ago in New Orleans I visited the WWII Museum, which was equally impressive. So, I'm off to pre-order your book, Aimie. Thank you so much for visiting the Jungle Reds today and bringing this important piece of history to our attention. I would like to think that I would have been involved during WWI or WWII if I had been of age, but it's a step up that I can't say for sure I would have made. Such brave women (and men). Hank, sorry to post off topic, but stumbled across another t-shirt for your collection. It memorializes the typos from dictated comments. Navy blue with white lettering: “ This shirt was created using speech wreck ignition soft wear.” ;-) Happy Friday. Perfect perfect perfect! I will do a whole blog about speech recognition,soon—too hilarious! This sounds brilliant, Aimie! I'm fascinated by World War 1 stories. I've just gone off to Goodreads and found your backlist, as well. Can't wait! I'm looking forward to reading your book, Aimie. Such a fascinating part of women's history. Oh, so great to see you here!